Earths fractured geology is visible in its fault lines. It is along these lines that earthquakes occur, sometimes with disastrous effects. 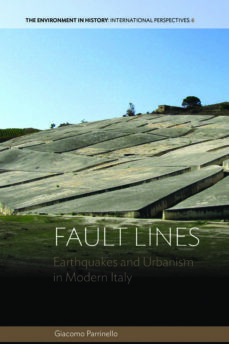 These disturbances can significantly influence urban development, as seen in the aftermath of two earthquakes in Messina, Italy, in 1908 and in the Belice Valley, Sicily, in 1968. Following the history of these places before and after their destruction, this book explores plans and developments that preceded the disasters and the urbanism that emerged from the ruins. These stories explore fault lines between "rural" and "urban,""backwardness" and "development," and "before" and "after," shedding light on the role of environmental forces in the history of human habitats.